Each day Arctic’s eyes lose more of their baby softness and gain more of the adult fierceness. 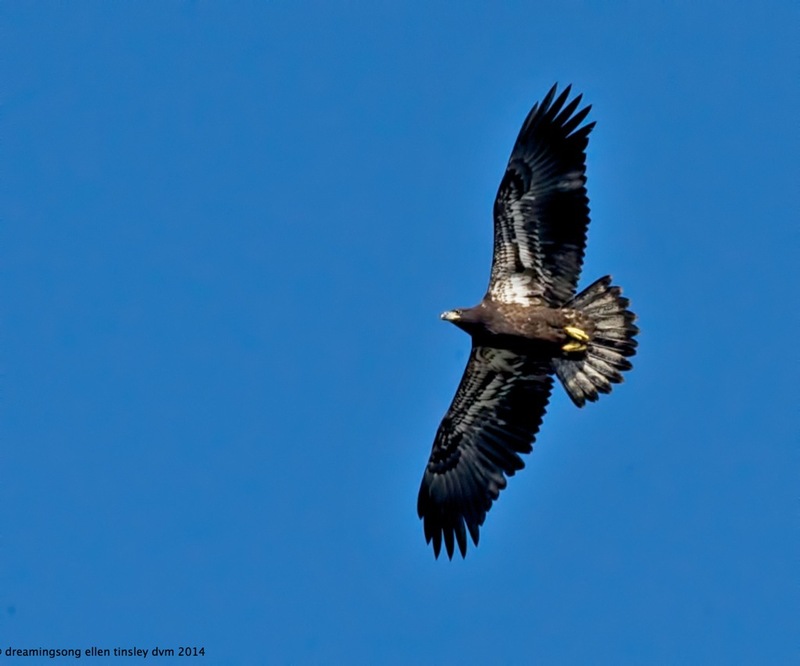 As I watched Arctic soaring above me this morning, I thought about the eaglet that was lost and the eaglet that was saved yesterday, here on Jordan Lake. Raptors of all sorts face a very challenging life even before they are hatched. So few of these top predators make it through the first year of life. The male sibling that was lost yesterday is mourned. The female sibling, Lil E, is getting a chance to make it to that first celebration of her hatching and the chance is given by rescuers, rangers, veterinarians and staff. The greatest Gift however, that will sustain her journey, is the love, concern and hope of all who have watched her from the moment she was laid. May all of the Creator’s world gather strength from the hope of Lil E’s community. doc ellen. I was at one of the Ebenezer boat ramps, hoping the grey weather would let up enough for me to catch some birds in flight. There was a flick of a tail, off to my right, on the rocks that line the parking apron. What need did I have of much light when a feathered piece of the blue sky waited for me to capture its rich colors.